Paul Hillier curates this collection of Arvo Pärt's instrumental and choral chamber music drawn from different periods in the composer's career. He brings together his celebrated vocal ensembles, along with chamber group NYYD, and long-time collaborator organist Christopher Bowers-Broadbent, to produce another powerful recording of ethereal sacred music. Paul Hillier works his magic. It is most definitely worth seeking out. It’s this inexorable journey to stillness, and the stunning economy by which it gets there which makes Pärt’s music compelling, timeless and moving. A sublime concord of voices and strings in Pärt's characteristic tintinnabulate flotation. It is no surprise that the virtuosic singers in Theatre of Voices and Ars Nova Copenhagen are often to be found in early music ensembles. The patient, softly-contoured gentleness they bring to the start of The Deer’s Cry is mesmerising and makes the stresses of its later insistence – climax seems too strong a word – all the more effective. The sound of the uppermost voice in Hillier’s choirs—soprano Else Trop—is somewhere between celestial and astounding. Es ist ein Glücksfall gerade für Pärts Musik, dass fast alle Interpreten hier sowohl Spezialisten für Alte als auch Neue Musik sind. The vocalists and instrumentalists sound heavenly. Paul Hillier works his magic. It is most definitely worth seeking out. 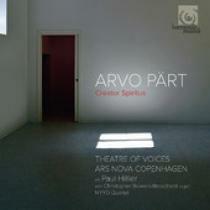 is perhaps the warmth and beauty of the voices of Ars Nova Copenhagen that is most immediately striking. Sur la pochette du disque, une salle obscure et déserte, au sol grisâtre et aux murs épurés. The quality of the singing, whether from choir or soloists, is outstanding.